Responsive web design (RWD) is a web design approach aimed at designing sites to provide an optimal viewing experience for your audience —easy reading and navigation with a minimum of resizing, panning, and scrolling—across a wide range of devices (from mobile phones to desktop computer monitors). Our clients prefer responsive web design because content that lives on one website and one URL is much easier interact with, rather than needing to manage content that lives on a separate mobile site. Responsive web design is recommended by Google, it allows one website to provide a great user-experience across many devices and screen sizes, and it also makes managing your SEO strategy easier. For these reasons, responsive web design is the best option for your SEO strategy. Cool Life CRM has seen our client’s realize increased activity, which feeds the CRM and sales pipeline by recipient’s viewing and responding to communications on tables and mobile devices. With the increasing use of portable devices, a RWD is essential to improving your prospects opinion at the time they desire the information. Our system provides a content management, Search Engine Optimization functionality, and menu builder tools that allow clients to easily update, build and grow their website. Download - What Is A Responsive Webite? Responsive design is a special way of designing websites which takes into account the various platforms on which a website will be viewed. If you have a responsive website, then your website will look great on any device - PC, tablet, mobile phone, etc. If you don't have a responsive website, then your page may load slowly or be hard to read and navigate and based on Google new requirements, your website will not be reconized as mobile friendly, which accounts for greater than 50% of website searches. 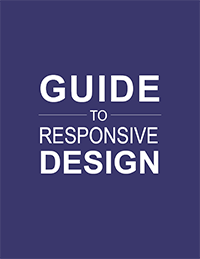 Learn more about what responsive design is, why it's important, and it's features by downloading our whitepaper.